2004 World Trade Centre, Mumbai, India orgainsed by SBI Bank. 2003 World Trade Centre, Jakarta (Indonasia). Shankar Sonawane's oeuvre covers a vast gamut of subjects. Not confined to any peculiarity, he explores a whole array of emotions involving war and peace. His palette comprises of bold hues, which enhance the solidarity of his expressions. His repertoire is a vivid portrayal of faceless urban characters, mystically eclipsed backgrounds and sometimes paintings of gods and goddesses. He brings to his canvas the horrifying shadows of war with as much ease as the flowing hues of the evening breeze. His work exuberates the intense and silent ripples that find a way to our innermost selves. Peace as an entity, cutting through all boundaries and religions, ruminates in his work. His paintings meditate over his ideology and philosophy. 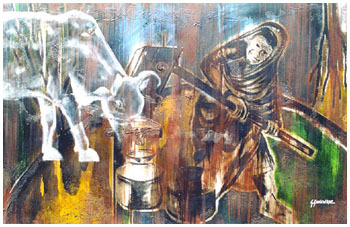 Sonawane's paintings demonstrate a kind of ruggedness. His strokes are confident. He has an exceptional ability to recreate space on canvas. Figurative in style, his work exhibits mastery and a high command over colour and form. Conviction and clarity of thought is supported by innovative use of materials and media. The more familiar of his body of works are, the depiction of the 'Buddha', goddess 'Kali', lord 'Ganesha' and the eternal 'Om'. These paintings have become a powerful language of peace and serenity, which one tends to surrender to subconsciously. Shankar has particiapted in a lot of Art Shows, Exhibitions, Art Camps and Workshops in India and Japan. He has received Awards and Honours in many such occassions. Listed here are a few of those efforts of his.